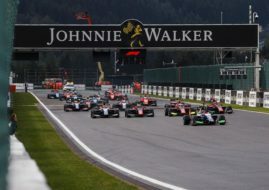 British rookie driver George Russell scored his maiden victory in the GP3 Series after being fastest in the Race 1 at Red Bull Ring. The 19-year-old Russell started from pole position and led until the end of the race. The ART Grand Prix driver relatively easily took the chequered flag after beating his teammate Jack Aitken by 2.3s. Actually, the French team took the top 4 positions after Nirei Fukuzumi and Anthoine Hubert, who has been handed 10s penalty, finished 3rd and 4th respectively. The start of the GP3 Series Race 2 at Red Bull Ring is on Sunday 09:10 CET.